Plus side is I already have a v8 and trans ready to go and a couple additional hands to help since I got the bender I made a couple jeep friends that want to hang out more. Thats cool. I forgot about the model that later became the dakota. As strait as the body is that would make a fun DD with a V8 in it. So I finally got my engine hoist back, pulled the axles out of the bed, opened them up to find a set of 4.56 gears and a spool in the rear, 4.56 and some sort of locker in the front. Unfortunately the front had been hit on a rock ledge at some point the cover has a pin hole and water inside, so it had a bit of surface rust. pulling the shafts and carrier today going to figure out what locker it is and see if gears are salvageable. Rear had disc brakes at one point buy some one removed them left parts of the brackets on the tube. Going to thru and reseal the whole rear and get the disc brakes put back on. Not sure if I want a spool in a truck I want to daily but not sure I want to change it out. so for the solid axle swap how does chevy 63" springs front and rear sound? along with the ruffstuff bracketry i could get it sitting on the solid axles in a weekend. ive been reading and reading and reading lots of threads on sas toyotas, chevys, dakotas. the concept is simple enough just need the mounts to be the same width as the spring perches, or move the spring perches to fit the width of the spring mounts. the v8 fits in the engine bay but the current ifs differential is in the way of actually mounting the v8 in the engine bay. going to have a trainee from work come by and disassemble the motor, clean and reseal everything. wrenching party this weekend to get the front diff out and the ifs disassembled. the rear 44 brakes put back on and maybe get that axle under the rear of the truck. 63" chevy springs in the front are going to be WAY to long. I would run a set of yota springs or even a set of 56" springs. So you think 56s up front and 63s out back or would 63s be to long out back also? 63s would be fine for the rear. Most yota guys run those. They will be fine in the back but I personally didn't like them in the back either. They just stick out so far that you will drag them everywhere. Ordered the front spring hanger kit for the 30.75" spring pad width of the scout axles and the rear spring hangers with bushings. Was looking into running either 3" Toyota lift springs or some 2.5" rancho 44044s in the front depending on height after install will determine the rear set. So the SAS is done, went with the rancho 44044s the total totalling came out to about 10 12 inches. Decided to go 63inch Chevy springs in back for the flex. Once I get the new outers on the front and the brakes done on the rear matching 44 going to get a,stock set of 63s to figure out how much lift/shackle I will need to level the truck. Drive train is looking like a hodgepodge of parts in the garage 5.9l magnum with a dui distibutor and a carb intake to run propane since ginger bent a rod or 2 during the floods earlier this year. here is a picture with the SAS done sitting on 36s up front now. Just ordered my spring hanger set from ruffstuff to hang the matching rear diff and thanks to 72 blazer for bringing the springs I needed. After this past weekend I plan on having this ready for next year's Midnight's run or turkey run. If the wife will allow me now that we have a little one on the way. I plan on having this ready for next year's Midnight's run or turkey run. If the wife will allow me now that we have a little one on the way. Any recommendations for axle shafts? And bolts for that flange? I have one in the garage, but it's not geared,locked and the wrong width. Okay since the lot liZard is running and driving and works well (enough) I'm going to start working on this rig again. Have a running 318/727/231 combo ready to go in. Need to install the rear axle to match the front and the 63s rear mount radiatior since it has a a small engine bay. Found the bolts I needed for the axle shaft retainers, so when those get here I will do the disc brake swap, and since I made some progress on cleaning up the garage I can actually get a car and truck in here at the same time, I will go get the midget soon along with the stabin cabin. Get her in the garage and start the rear axle swap and rebuild the front axle. 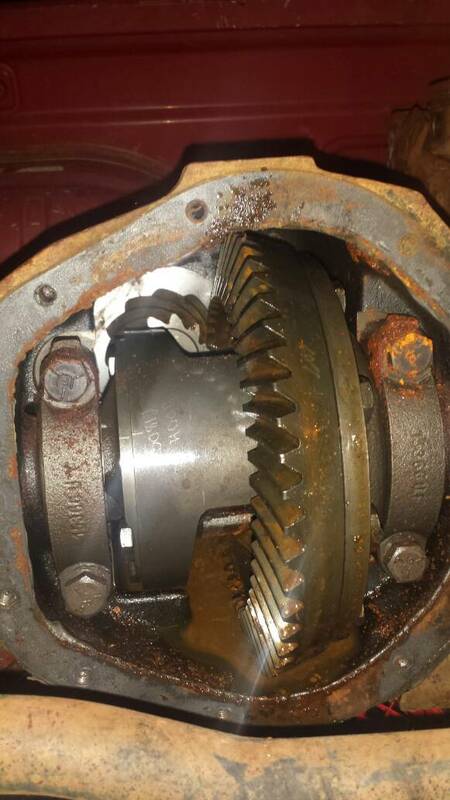 Also read deep into the night last night about using Dodge outers on the scout axle to keep the 5.5x5 bolt pattern bigger bearings and internal locking hubs, also I just happen to have a Dodge Dana 44 with flat tops for high steer hmmmm. Last edited by Ramman84; 04-10-2018 at 12:18 PM. Reason: More thoughts. yeah... RCV's ain't cheap. I looked into those last year. Talked to Artie and he has broken one if not two of them. Stop being web wheelers. Rockwells! where did you find the bolts?